Anastasiia Strakhova is a Ph.D. candidate in History at Emory University in Atlanta, GA, and this year a research fellow at the Center for Jewish History in New York. Internationally trained in Jewish Studies and History, she completed her undergraduate degree at International Solomon University in Ukraine, and then earned a master’s degree at Central European University in Hungary. 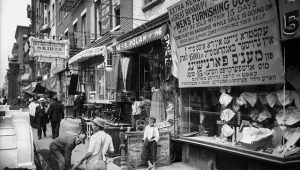 Before the Immigration Act of 1924, thousands of Jewish immigrants were changing familiar life of Ukrainian “mistechka” for bustling New York. Trying to become Americanized, re-settlers nevertheless were changing image of the metropolis itself. Some observers even referred to the Jewish neighborhood in New York as American Berdychiv.